Krzysztof Pater is EU representative of the Polish Scouting and Guiding organisation. 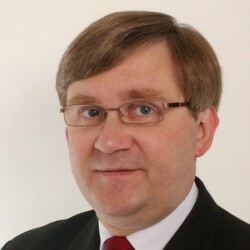 He has been a member of the European Economic and Social Committee since 2006. Between 2008 and 2010, he was the President of the ECO Section (Section for Economic and Monetary Union and Economic and Social Cohesion) and currently he is President of the Labour Market Observatory (LMO). Before that, Krzysztof Pater has been employed in the Polish Ministry of International Economic Relations, in the Ministry of Privatisation. Working for the government since 1995, he has been involved in the reform of the Polish pension system, being responsible for the creation of the concept of the funded pillars in the new pension system. He also worked in the newly created pension sector and next as independent advisor for public, scientific and private institutions. In November 2001 he was nominated as Undersecretary of State in the Polish Ministry of Labour and Social Policy. Later, in May 2004, he was appointed as the Social Policy Minister in the Polish Government. He resigned in November 2004, since when he has been working as an independent advisor and researcher on social and labour market problems. Since January 2006 he has also been a permanent advisor to the Polish Parliamentary Social Policy Commission.